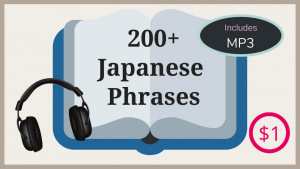 Let’s learn some common Japanese phrases in this lesson! Before I introduce those phrases, let me talk about speech styles. We Japanese differentiate speech styles depending on who we are talking to. We have Formal speech and Informal speech. Native Japanese people, when they are little, first learn the Informal speech because this is the speech style that we use to communicate with our family members and close friends. And as we grow old, we start interacting with people outside the family circle and gradually learn the Formal speech. Because of this reason, Formal speech makes you sound mature and educated, and also polite and respectful to other people in the society. On the other hand, Informal speech shows closeness and intimacy to the person. However, it can make you sound immature when used in inappropriate situations. Some of the common Japanese phrases I cover in this lesson have both Formal and Informal versions. Some have only the Formal version of it because they are expressions that we use just outside the house. Ok, let’s begin! “Good morning” is the very first thing you would say to your family when you wake up, so of course, we have the Informal version of it. This expression is the most common way to say “Hello” during the day. We never say this to our family members or someone close. We use it only outside the house for formal settings, so there is just the Formal version of this phrase. “Good evening” or “Hello” for the evening time. Just like こんにちは Konnichiwa, we never use this for our family members or close friends, so there is no Informal version of this expression. “Good night” is the last thing you would say to someone when you go to sleep, so of course, we have the Informal version of it. おやすみなさい oyasumi nasai is a little longer than おやすみ oyasumi, and although it is not necessarily the Formal version of this expression, it sounds slightly more polite and better than おやすみ oyasumi. 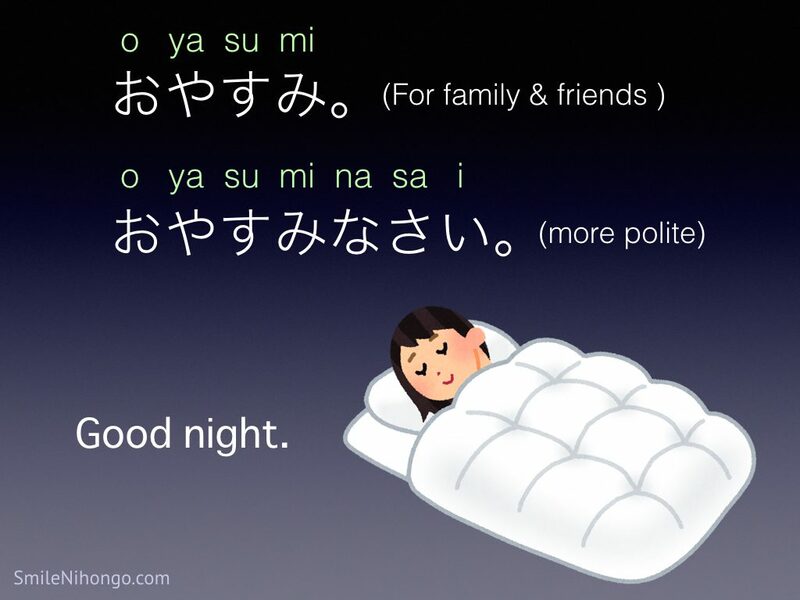 So, if you are going to say “Good night” to someone who is not so close to you, you may want to stick with おやすみなさい oyasumi nasai. For your family members and close friends, it’s up to you. You can use either one. I personally you both to my family. I never say おやすみなさい oyasumi nasai to my little sister, but I sometimes use おやすみなさい oyasumi nasai to my parents. 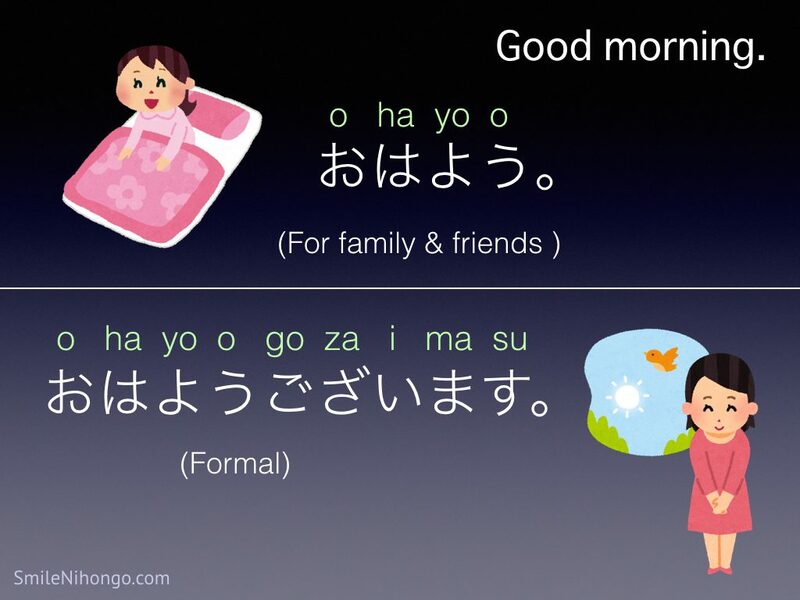 Just like “Good morning,” the Formal version has ございます gozaimasu added to the Informal version of the expression. This “Hello” is entirely different from the “Hello” こんにちは Konnichiwa that we discussed earlier. You can use this “Hello” only one time to one person when you meet him/her for the very first time. はじめまして hajimemashite literally means “this is our first time” so this is the very first thing that you would say to someone when you meet the person for the very first time. After saying はじめまして hajimemashite, you can tell your name, occupation, etc. and basically introduce yourself. You will never use these two expressions inside the house. You will only use them outside as a grownup when you meet someone for the very first time. “I see” is such a small thing to say but it’s very important in Japanese conversation to show that you are actively listening to the person. Some male people add か ka after the Informal version of this phrase and say そうか soo ka. However, it is only used in the informal situations so be careful not to use it in the formal settings even if you are male. I hope you had fun learning common Japanese phrases in this lesson. Repeat the lesson a few times until you feel comfortable pronouncing each expression. You can download the list of Japanese phrases below. Provide your name and email address so that I can send it over to you right away. 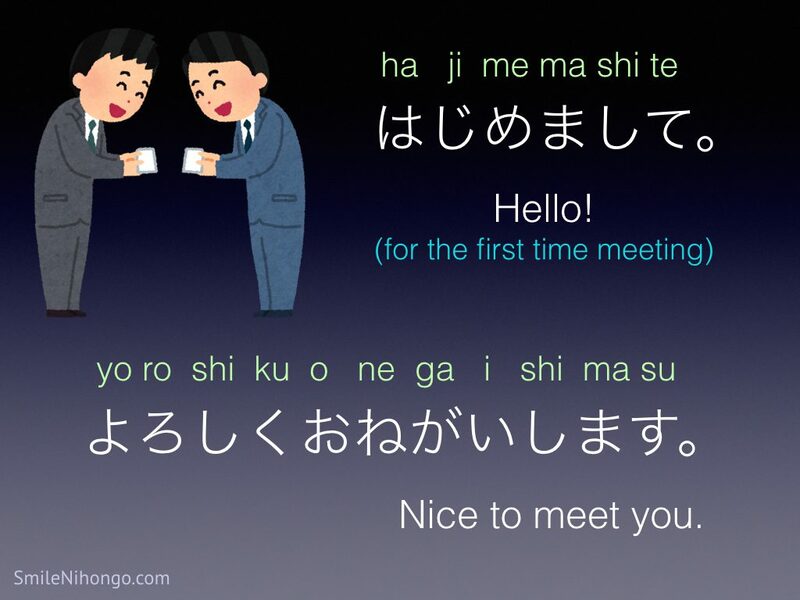 Do you want to learn more common Japanese phrases and learn to introduce yourself? 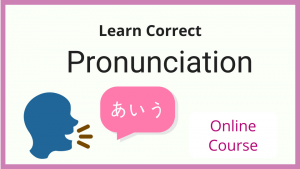 Join our online course (free) and learn simple techniques to introduce yourself properly in Japanese. Click the button below and you can watch a sample lesson and learn more about the course before signing up. Hello Yuko sensei thank u for the free PDF materials so kind of u! thanks for the free teachings.May God bless u always for sharing ur skills to us!Be safe always!!!! Hajimemashite! Thank you for the kind comment and wish for me. 🙂 I am glad you enjoyed my materials and lessons.